I’ve only read about this, but I never thought that I would actually try them out myself. When I got inside the waiting lounge at the Centennial airport, I saw this Boeing 747 docked in one of the bays. I’m always drawn to airplanes, and I would almost always whip out my camera and take a picture. It never occurred to me that I will be riding this plane. Never did I also imagine that it would feature Recaro seats with Audio and Video on Demand (AVOD). The project involves the installation of state-of-the-art in flight entertainment systems, new business-class and economy-class seats, and the infusion of a new, modern look that emulates the tranquil seas and sandy beaches of the Philippines. The new Mabuhay Class cabin is luxurious cocoon seats supplied by Recaro of Germany. The new seat has a fixed privacy shell that enables the passenger to enjoy utmost privacy while an ergonomic design transforms it into a lie-flat bed. The seats are adjustable to a variety of positions. Each seat is equipped with its own programmable position controls with memory, individual directional LED reading light, oversized tray table and bottle holder. My eyes lit up at the sight of this small screens at the back of the seats right in front of me. Mind you, I’m only flying economy, so this is quite a treat. PAL now have a separate mini-magazine of their entertainment selection called Flights of Fancy. This lists the movies available for viewing, as well as TV shows, music CDs and even games to help you pass the time while flying. Since the flight from Manila to Hong Kong was only an hour an a half, the entertainment choices were limited to TV shows (and a very limited selection at that), the radio and games. 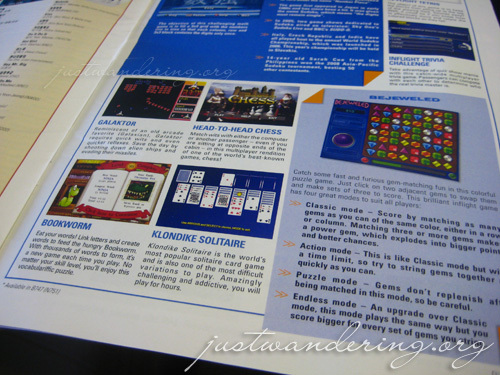 The displays were touch-screen, so you can navigate through the menus on screen or by using the control. The touch screen comes specially handy when you’re playing Bejeweled or Bookworm. 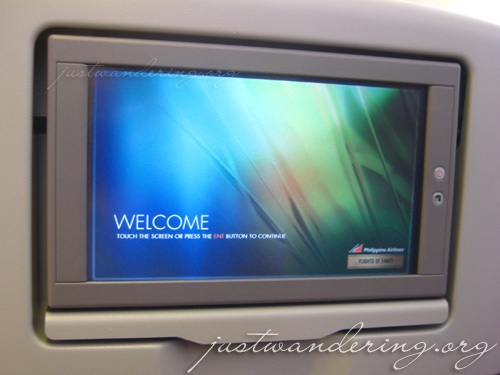 Philippine Airlines has refurbished several of their big planes (Boeing 747-400, Airbus A340-300) with the comfortable Recaro seats and installed the personal AVODs to be competitive with other international airlines that offer the same. I’m not quite sure when I’m flying PAL again, but it was great to have experience this at least once. 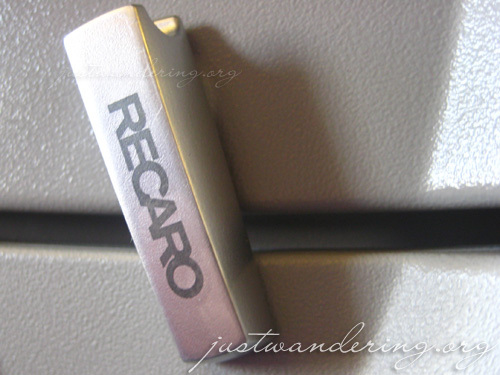 recaro is a name i equate with bucket seats used in race cars. they’re the only car seat manufacturer i know who factored in the G-force effect on passengers and drivers and their designs have become standard on almost every sports car. pahabol po. now i remember! the boeing 747 400 debuted in 1989 and was first seen in asian skies as the singapore airlines’ Megatop. at that time, they said it flew higher than most other airplanes and it was also the plane i took during my first trip to the US in 1990 (hehehe, ancient na ko, i know). I’m a fan of the blog, BTW. Talaga Tara? Nice! They started refurbishing nung 2007, so this is probably one of the newer installs. Oh. Tagal na din pala? But it’s nice and I’m glad we have something to be “abala” with during those long and uncomfortable trips. Oh this is such a good news! I was wondering when PAL will have these back seat tvs like Singapore Airlines. It’s been 2 years since I flew PAL. A lot has changed! Can’t wait to try the latest upgrades. By the way, I’m flying Zest Airways this May. I can’t wait to see what the inside looks like!! I go to Cebu every now and then and I always book the 3PM outbound flight because they use the 747. I hope they use the refurbished and reconfigured 747 one of these days and I hope to be on that flight. hay naku, PAL is so ancient talaga kahit bago yung seats. ka-cheapan. as in, ayoko nga ng PAL. cheap talaga. as in. yucky, super talaga. as in. haay naku, ano ba to. kahit pa. as in talaga. cheapy-pie cherry pie pa rin.